Last week, Janeen asked how I measure the temperature of these teas we're tasting, so today I thought I'd include a word about my tea thermometer. I believe I bought this from Upton Tea years ago, but I've seen these offered from many tea vendors. I've learned that if I let my clear glass stovetop tea kettle come to the boil and just start to whistle, that gives me water that's about 180 degrees according to the little thermometer popped briefly in the glass teapot I use for steeping teas. I'll have to let the water boil longer when I begin to taste the teas requiring a higher temperature, but for now I've gotten the hang of getting water to the 170-180 degree range. 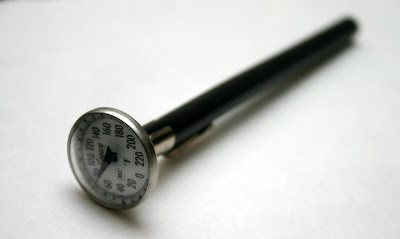 I love my little tea thermometer, and for just a few dollars investment, it's a useful addition to a collection of tea accoutrements. Dry leaf appearance: Tightly furled little leaves, almost circular. Look almost shriveled up, like they were made of wool and thrown in the washer and dryer by mistake. Wet leaf appearance: Surprisingly, these leaves unfurled and opened fully. The dry leaf appearance made me think these wouldn't expand as much. Wrong! Scent: Finally, a distinctive aroma I *know* I recognized: steamed asparagus! And there was also a hint of something that made me think of some sauce in a Chinese restaurant, but I can't figure out quite what that is yet. Flavor: Shouldn't have steeped this for the full three minutes, as the first cup had that bitter green tea taste I so dislike. But then I re-steeped the leaves for just two minutes and LOVED it. A very strong but non-bitter taste. I like this a lot, and will make it again steeped for just two minutes. Additional notes: I'm learning that when a range of steeping times is offered, my palate seems to prefer the shorter one. Is your credit card a rewards card? Mine is, and I'll take my rewards points in the form of gift certificates to T.J. Maxx, thank you very much. It's a great and easy way to earn free stuff just for using the card to pay regularly-occurring, pay-'em-off-each-month bills such as utilities and insurance premiums. I regularly receive $10 gift certificates to T.J. Maxx (and Marshall's) in the mailbox, and I have this real "thing" about finding approximately $10 worth of free tea-related goods with them each time. My latest freebies: This clearance teapot ($5.50) and mint condition cookbook ($3.99, retail $24.95). Because I've amassed so many teawares, I no longer can buy just every teapot and teacup that catches my eye unless we add a wing to the kitchen. 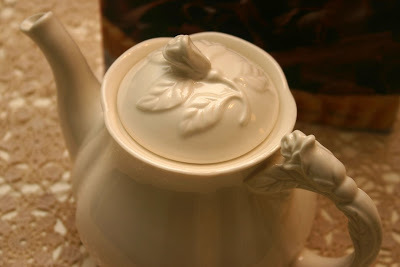 In fact, I saw this rather inexpensive rose design teapot at a T.J. Maxx before Christmas but left it there. Then I got the pretty creamware tea mugs and sugar bowl and creamer for Christmas and wished I'd bought it. When it showed up on the clearance shelf on a day I was "rewards points" shopping, I knew it was a sign. And I can't believe I'd never heard of this great book, "Artisan Patisserie for the Home Baker" by Avner Laskin. 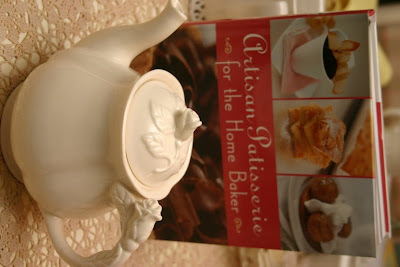 It has a recipe for lemon tea cakes and also recipes for tarte tatin, cream puffs and eclairs, various shortbreads and other luscious goodies that seem perfect for a tea party. And best of all, of course, is that the teapot and book were ... free! 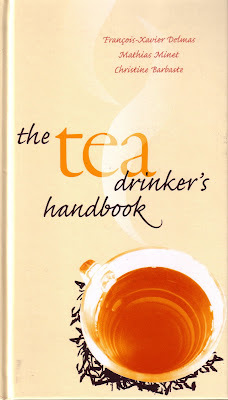 "The Tea Drinker's Handbook" is without a doubt one of the most intriguing tea books I've ever come across. I had assumed this new release would be a general, tea-for-beginners type of book, but that isn't the case. In fact, with its almost encyclopedic amount of information on tea, this book seems geared for us "true believers" rather than those seeking an introduction to the wide, wide world of tea. Written by the founders of the French company Le Palais des Thés, François-Xavier Delmas, Mathias Minet and Christine Barbaste, the book is divided into three main sections: What is Tea?, Tasting and the World's 50 Best Teas. I will readily admit to being a tea geek at this point, so I loved discovering some of the more arcane facts related to tea. For instance, have you ever wondered precisely how those tea pluckers pluck? Pause a moment. Picture yourself plucking two leaves and a bud with your fingers. (If no one's around and you won't embarrass yourself, feel free to act this out as I did.) The authors say good hands and a good eye are both required, because "the young shoot to be taken is held between the index and middle fingers of each hand, broken by the thumb, and thrown over the shoulder into the basket or sack hanging on the back of the plucker." The tasting section contains loads of information on how professional tasters go about their business. Frankly, it's a bit overwhelming. I'm grateful I found my own tea tasting method earlier this year. The section on their pick of the world's 50 best teas will be fun to compare with my "Harney" list as I continue on with my year of tea exploration. 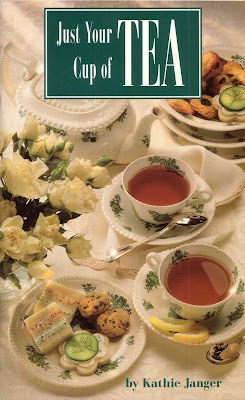 This book also depicts the recommended teas at the top of each page, which is a nice touch. My only real criticism with this book is the large number of typos and grammatical mistakes it contains, especially in the first 50 or so pages when I was trying to really dig in. If this happened merely a time or two I'd not even mention it, but I'm afraid the errors are quite a distraction. There are also "sidebars" of information that are in such a tiny pale gray font they are difficult to read. Still, if you are a true tea fanatic, you will probably have to have a copy of this book for your tea library, because there is simply too much good stuff you won't want to miss! As much as I love to give handmade gifts, I have to tell you that I simply adore receiving handmade gifts because I so appreciate the time and effort and sheer thoughtfulness that goes into such a gift. 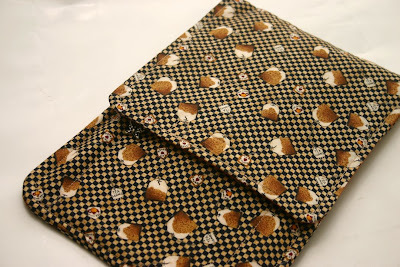 For that reason, I was simply delighted when ParTea Lady surprised me back before Christmas with this adorable handmade sewing/crafts organizer she stitched from a Debbie Mumm teabag print fabric. Since I am still (slowly) working on blocks for a Cathedral Window Quilt, that is what I am using this for at the moment. 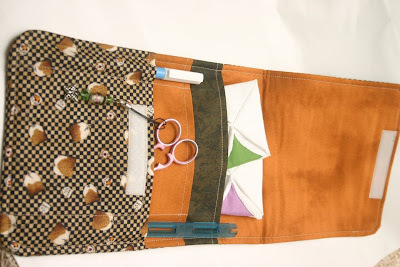 There are so many great pockets inside, so I can store a fabric pen, a plastic marking tool, scissors, fabric squares and completed quilt squares. And if I ever complete the quilt, this will no doubt adapt quite well to papercrafts or whatever the next project is that I take along in this classy organizer. I was (and am) especially smitten with the design of the fabric. It just makes me smile! And so does receiving such a wonderful handmade gift! 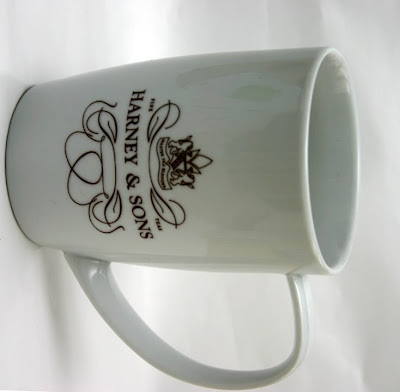 Back before Christmas, I included a Harney & Sons logo mug in my tea order, but I hadn't realized what a whopper of a mug this is! I don't normally drink 11 ounces of tea at a time, but I certainly can now that I have this mug. It was just $6, which is certainly a fair price, and since Harney is one of my favorite tea vendors I wanted this mug for my small collection. It *is* a collection if you have more than two of something, right? 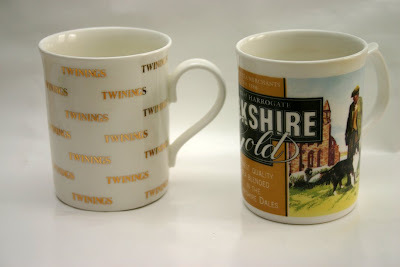 Here are two more tea logo mugs, from Twinings (from the shop in London) and Yorkshire Gold (purchased at a British goods shop, whose name I can't remember, in the Atlanta area). These can usually be found in my tea cabinet in the kitchen holding various spoon infusers and teaspoons. 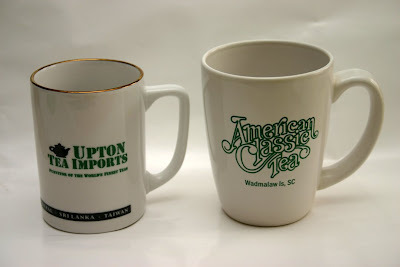 I also have mugs from Upton Tea and American Classic Tea from the Charleston Tea Plantation owned by Bigelow. I've seen a vintage Lipton tea mug on eBay featuring the man in the white cap sipping tea, but I have a feeling I'll come across that in an antique mall someday. Do you know of any more tea logo mugs I should be looking for? Normally I wouldn't share a recipe and tell you to make it at your own peril, but that's exactly what I'll be doing today! 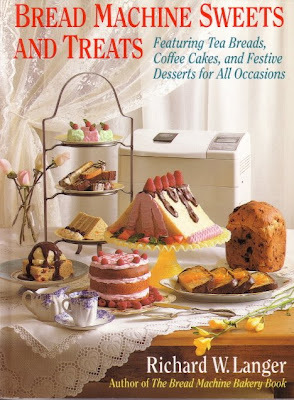 You see, last year I was searching for some particular tea books online and came across a great buy on "Bread Machine Sweets and Treats - Featuring Tea Breads, Coffee Cakes, and Festive Desserts for All Occasions." Last weekend, I decided it was finally time to make something from the book. 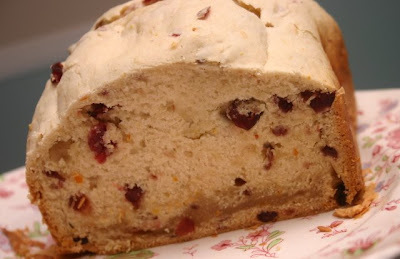 I decided on the Cranberry-Orange Bread, only I didn't have an orange and used a lemon instead, which proved to be prophetic. The recipe said to bake the loaf on the bread machine's quick cycle, so I did. It smelled yummy while baking, but apparently the "quick cycle" was the "too-quick cycle," and out came a heavy, yeasty, square-shaped lump of dough. I popped it in the oven to try to salvage it, but no go. Since the book was written in 1993, I decided to go back and read the introductory chapters to see if bread machines have changed in the last 16 years. I learned that a "quick" cycle should be just an hour less than a normal cycle. Alas, that's not the way my machine operates. You have your basic cycle, which is about four hours; the dessert cycle (and a few others), just under 2 hours; and the super-duper quick cycle, for bread in an hour. So yesterday I tried again, opting for the dessert cycle this time, and I'm 90 percent pleased with the loaf that resulted, especially since I did have an orange on hand this time. Add ingredients to the bread machine pan in order listed. I baked this loaf on the dessert cycle (1 hour, 55 minutes), and as you can see it needs a tiny bit more baking, but my machine doesn't allow me to adjust the time. If you decide to try this, a) good luck and b) I'd love to hear how it turns out! 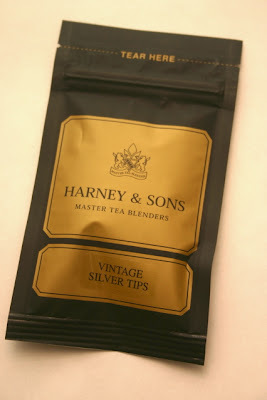 When I first looked through "The Harney & Sons Guide to Tea," one of the things that surprised me was that Michael Harney actually recommends a few tea companies other than his own, which I thought was a very gracious thing to do. Among the other vendors he lists in the book is Upton Tea. When I realized not all the teas in the book were available in sample sizes from Harney, I consulted my latest Upton Tea catalog and ordered some of the samples there. Before the year is over I may be ordering samples from anyone who can supply them, but so far I've found the first three or four months' worth purely from Harney and Upton, and that suits me just fine since I have received excellent service from both. This week, I wanted to mention a particular tea tasting technique Harney recommends. Or perhaps I should say "tea sniffing technique," because he basically encourages you to get your nose down in the pot and really get a good whiff of the tea leaves. I didn't know that the first smells when you remove the teapot's lid are just water because "the vaporizing rate of water is faster than that of the aromatic compounds in the leaves." Makes sense. I started doing it his way, and he is right: There is much, much more of a distinctive aroma when you pour off the tea, stick your nose as close as possible to the wet leaves, and sniff away. I don't recommend doing this with an audience, as I know I don't look very ladylike doing it, but I do think I'm educating my sniffer, and that's what it's all about! 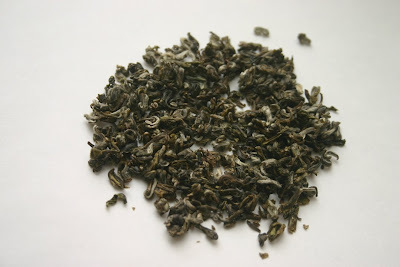 Name of tea: Bai Mu Dan (White Peony) -- It's also known as Pai Mu Tan. Wet leaf appearance: Wet dark green leaves, again with the noticeable variation in size. Scent: A stronger scent than the other white teas, and initally it reminded me of the scent of water poured of freshly boiled butterbeans or peas. Interesting! Flavor: At first sip, this was a bit strong for my tastes, and it had a very "dry mouth" feel after I was finished sipping. Maybe I used too much tea? I tried a second cup. Hmmm. But then I added some slightly cooled water, steeped it for about four minutes, and this was perfect! If I make this tea again (and I always get at least two or more cups out of these sample packets), I will use less tea from the get-go. Additional notes: I'm starting to pay attention to the fact that subsequent steepings can sometimes be as enjoyable as (or better than) the first one. You brave souls who live north of the Mason-Dixon line may have your cold weather back, as I am quite weary of it! We should see a return to more civilized temperatures in the fifties and sixties in the coming days, but in the meantime I am keeping lip balm, facial moisturizers and hand creams at the ready. 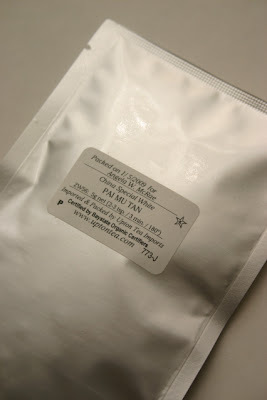 And this week's skin-softening find? This White Tea Body Soak. 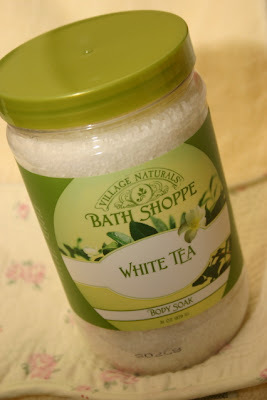 I found this Village Naturals Bath Shoppe product at Publix earlier this week, and at $3.49 for a huge, 31-ounce canister, this is a great "cheap luxury." It also comes in a bottle of foaming milk bath, but I chose the blend of dead sea salts, vitamins and minerals. I checked the ingredient panel this time (having bought one too many products merely "inspired" by tea), and yes, camellia sinensis leaf extract is indeed an ingredient here. To use, you simply toss a handful of these salts in the bath and swish them around to dissolve. The bath soak has a pleasant floral scent from the jasmine extract, and I highly recommend it with a hot bath as a pleasant way to end your evening. Or begin your weekend! In my area, I occasionally hear of a silhouette artist coming to town, usually to some children's clothing store or similar business. I'm intrigued by the art and craft of cutting silhouettes, and I think groupings of them are quite smart. In fact, I recently learned of a local silhouette collector I hope to feature in our magazine this year. Did you by chance visit the Senate web site about the inauguration? If you missed it, go here to see the Lincoln China they used at lunch yesterday, and go here to see the lunch menu and recipes. Those Cinnamon Apple Sponge Cakes sound awfully tasty to me, and they'd go quite well with that Presidents' Day Tea menu in the new Tea Time. Unlike the projects yesterday, these quilts aren't on the cover of their respective publications, but I hope these "inside photos" will at least give you an idea of what the piece looks like. 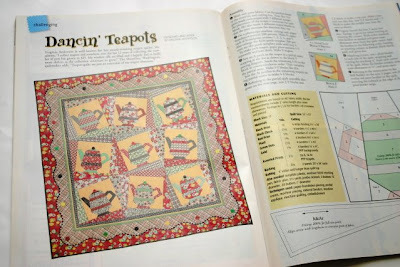 This "Dancin' Teapots" quilt was featured in the Jan/Feb 2006 issue of Quilter's Newsletter Magazine. I recently read that this pattern has been published in a book along with several variations of the pattern. 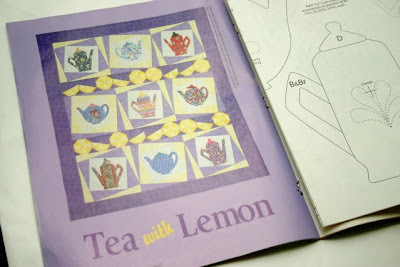 "Tea With Lemon" was featured in "Quilting for Everyday Celebrations!" 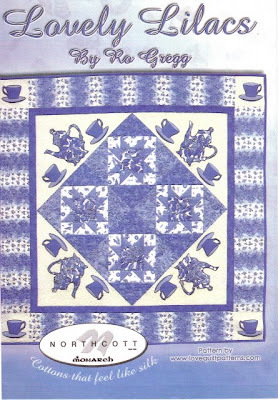 2005, a special issue from Quiltmaker's magazine. 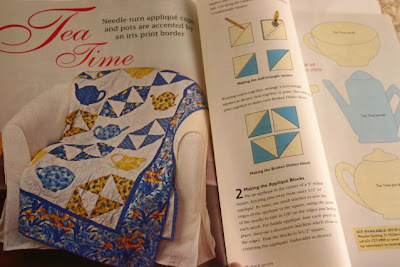 "Tea Time" is the name of this needleturn applique quilt pattern featured in Quick Quilts #5, a 2008 magazine. 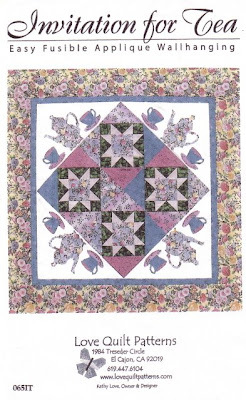 "Tea Time" is also the name of this pretty applique quilt, featured in the May/June 2006 issue of Fons & Porter's Love of Quilting magazine. 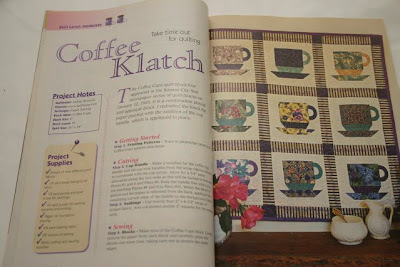 This "Coffee Klatch" wall hanging appeared in Patchwork Quilting magazine #29 from 2006. The block is actually called "Coffee Cups" and first appeared in the Kansas City Star newspaper in 1935. 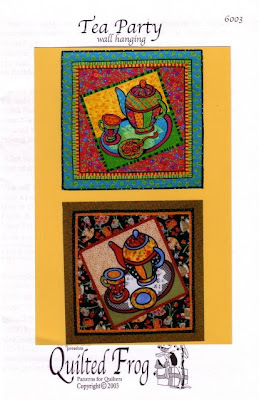 And coffee also gets the credit in this wallhanging of a stack of cups and saucers, from the Spring 2006 issue of Quilts and More magazine. 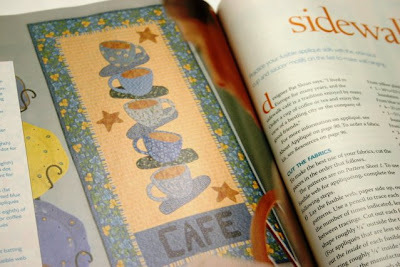 The piece is titled "Sidewalk Cafe," but I think it would be quite simple to applique the word "Tea" instead of "Cafe." Kaffe Fassett's "Quilt Road" includes this gorgeous, brightly-colored "En Kopp Te Til Kaffe Quilt." I have no idea what that means. Coffee with Kaffe, maybe? Anyone? 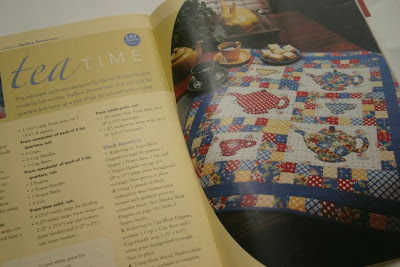 A tea-themed quilt is also in the book "Tea Party Time" by Nancy Martin, and I wrote about it here. There is also a great link here for more free patterns. And as someone has already thoughtfully done with yesterday's post, please feel free to list any other tea-themed quilt patterns you know about! 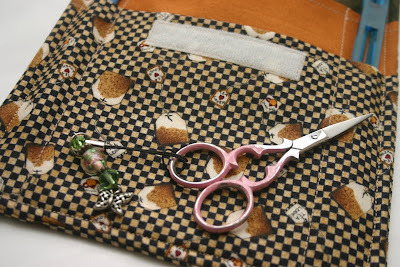 Over the weekend I did some sewing on a small piece that will be a gift, and that set me to thinking about what project I want to start on next for myself. 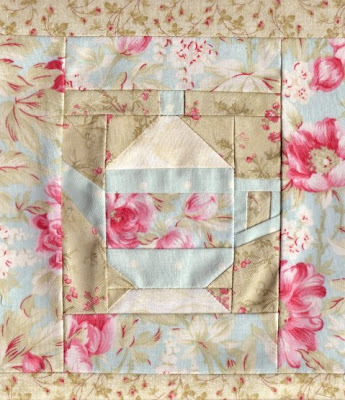 Maybe one of those tea-themed quilts I've been wanting to try? I started collecting the patterns before I even really learned to sew, and now I think I'm ready to take the plunge. 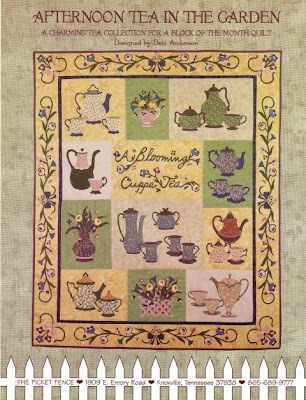 Since several of you seemed to enjoy seeing the quilts at my local quilt shop in Friday's post, I thought you might like to see some of the tea-themed quilt patterns that have been designed in recent years. I've found these at a variety of places (quilt shops, JoAnn's, Keepsake Quilting, eBay), but I'll also include the web site if one is listed in case you see a quilt you want to make or have made. 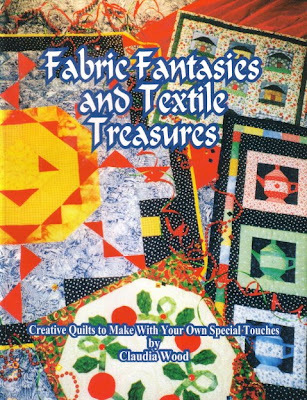 This book, "Fabric Fantasies and Textile Treasures," is by Claudia Wood, a talented quilter, needlework designer and fellow Cowetan. 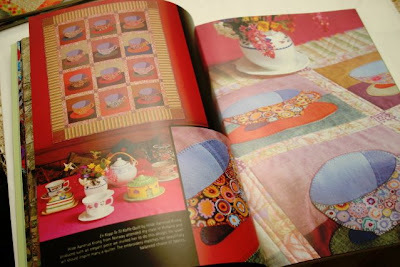 She taught the paper piecing class at Heritage Quilts and Fabrics where I learned to make the pieced teapot at the top of this post, and this is the book with that pattern (shown at right). 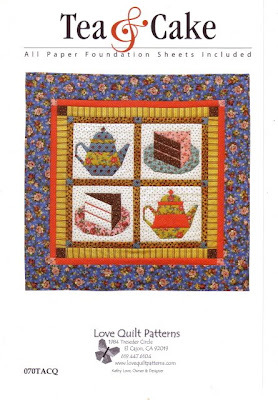 "Tea & Cake" is a pattern by Love Quilt Patterns (lovequiltpatterns.com). 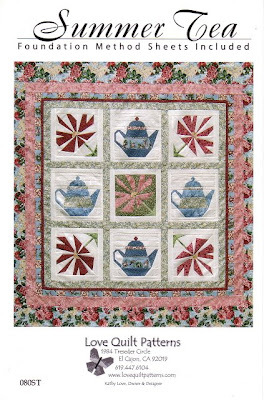 "Summer Tea," also by Love Quilt Patterns, features that same teapot above but in different fabrics and a different design. 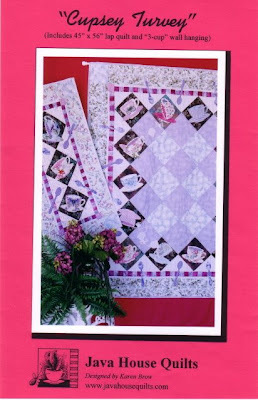 Also from Love Quilt Patterns is this "Invitation for Tea" quilt. Here's "Invitation for Tea" in another colorway, and this is the reason I bought this pattern. All those blues ... wouldn't this be pretty in a room with Blue Willow china! 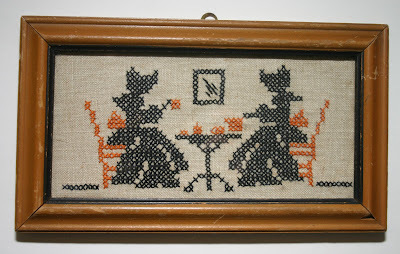 This "Tea Party" wall hanging is from Quilted Frog Patterns for Quilters (quiltedfrog.com). "Cupsey Turvey" is the name of this pattern for a lap quilt and wall hanging. I love how the spoons are scattered across these designs. 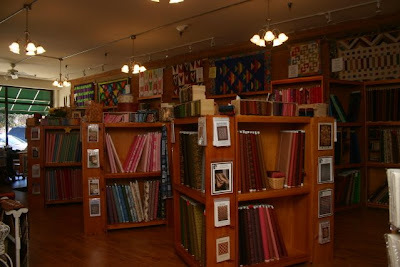 Source: javahousequilts.com. 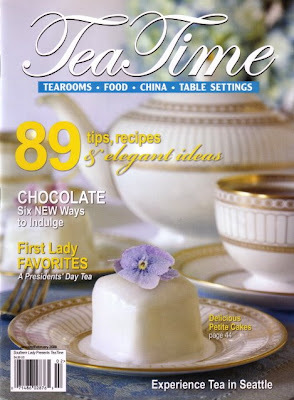 "Tea-Time" is the name of this appliqued teapot and teacup design featured in Vol. 4 No. 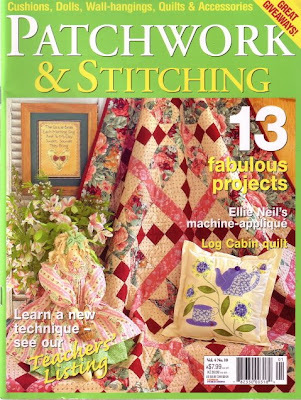 10 of Patchwork & Stitching, one of those lovely Australian needlework magazines. 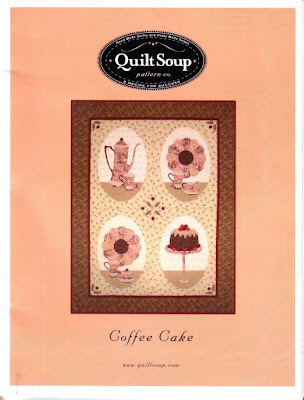 "Coffee Cake" is the name of this pattern from quiltsoup.com, but I insist that's a teacup in the quilt, since I've yet to see a "coffee cup" with a pretty scalloped saucer. And finally, this Afternoon Tea in the Garden quilt from The Picket Fence (thepicketfences.com) is something I hope to attempt after I get a lot more practice in applique. I saw this on display at a quilt show and it was simply exquisite. And that's enough for today! My white tea tips have gone on a diet! 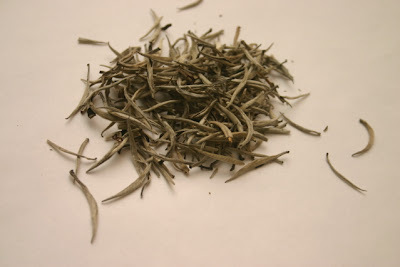 The tea leaves (tips, actually) that poured out of this week's sample packet were skinny little things and weren't as fluffy as the Silver Needles tea. 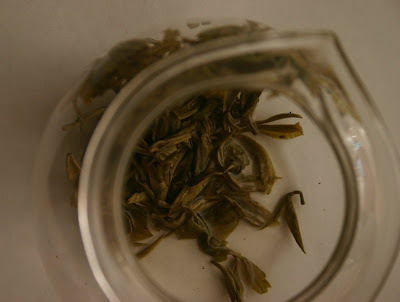 And while I knew that visually it would be hard to beat those beautiful Bai Mei flowers last week, I have to say this particular white tea's flavor is my favorite so far. 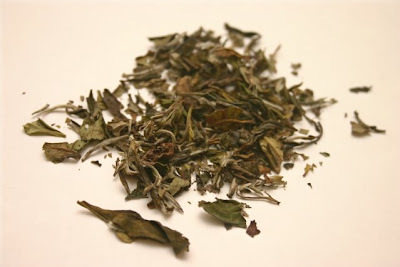 Flavor: Has a more robust flavor than the other white teas - really liked it! 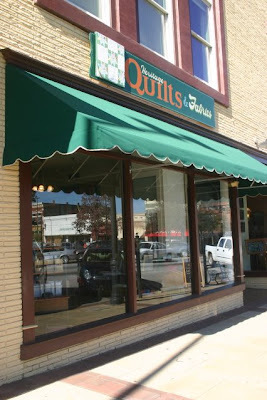 Yesterday I had the privilege of hosting my first tea party of the year, and at my local quilt shop! 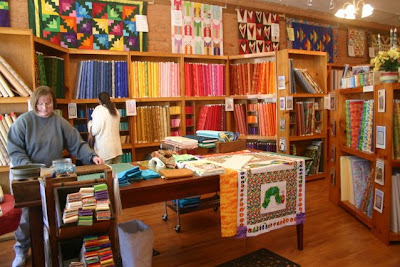 Last fall, Heritage Quilts and Fabrics in downtown Newnan formed a book club that reads books on the topic of quilting. We started out with Jennifer Chiaverini's wonderful Elm Creek Quilts books, and now we've switched over to Earlene Fowler's mystery series, all of which have a quilt pattern as the title. This time we read "Fool's Puzzle," and since I had signed up to provide refreshments a few months ago, I knew that National Hot Tea Month *had* to feature a tea party. 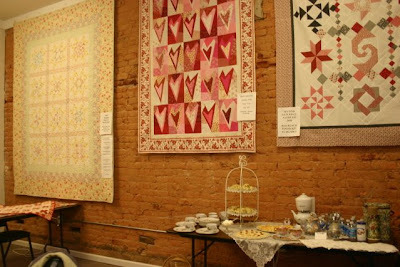 Is that not a gorgeous backdrop with all those lovely quilts? And the ladies were so appreciative of this little tea party, they actually clapped for me! Is that sweet or what! I've done a "traveling tea party" quite a few times now, for up to 30+ folks, so I have learned that a picnic basket and some thick bath towels are wonderful for transporting teacups and saucers, or in this case, tea and toast sets. I kept the menu simple for this "Cream Tea." We had two flavors of scones (chocolate chip and cranberry-walnut) with fresh whipped cream, lemon madeleines, and those Apricot Darjeeling Tea Cookies from yesterday. (Marilyn, if you happen to be reading, I loved telling everyone that my "blog friend" from Marmalady's makes all the the tea-infused jams I love!) 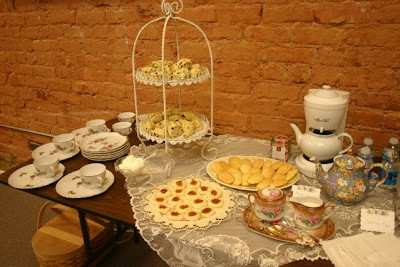 I prepared English Afternoon Tea in the Mrs. Tea maker, and I had brought thermoses of boiling water for the Ginger Mango Green Tea. I also brought small bottles of water for any non-tea fans (although I think everyone actually tried some tea) and a jasmine display tea. There were 10 of us, which was just about perfect since that's the number of matching tea and toast sets I had. I could've fudged with a few extras, but it was nice we had precisely 10. 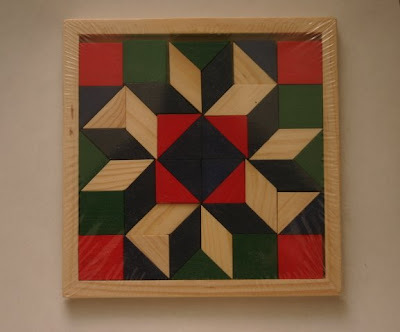 I had found some wooden quilt block looking puzzles on clearance at Michaels for just 60 cents each, and I bought a dozen as tea party favors and hoped for the best. I was happy when quilter Joanna opened hers and started moving all the little pieces around. That's exactly what I expected a fellow quilter to do! I love seeing what new fabrics and patterns Kris gets in, and I enjoy going in sometimes just to see what new quilts are on the walls. She also has a wonderful, calm atmosphere in the shop, so sometimes when work gets hectic I take a break by walking over to chill for a bit. There's often some nice music playing in the background, and the women who work there have always been happy to answer every silly question I've ever had. 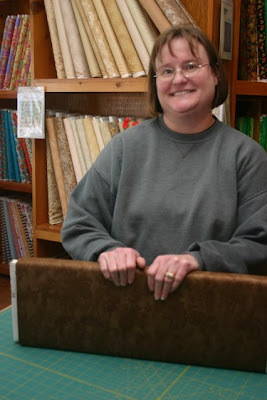 And here's Kris Townsend, the proprietress herself, who pretty much always has this smile on her face! Her store just celebrated its third anniversary in December, and I am thrilled the shop continues to do so well. Kris also knows I aspire to go into business one day myself, and she has been very kind to answer my (somewhat nosy) questions when I've asked. She is definitely someone I will look to as a mentor. If you visit our famous Courthouse Square someday (and please let me know if you do -- I'll meet you there), here is what to look for from the street. 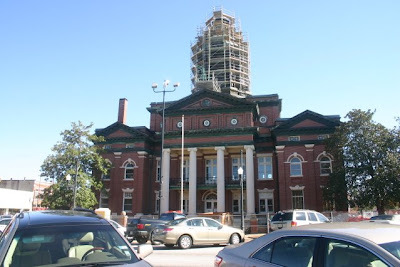 Just across the street, renovations continue on our beautiful Coweta County Courthouse. I hope these photos have whet your appetite to visit downtown Newnan if you're ever in the area! Cream margarine with sugar. Add egg yolks, vanilla and salt and mix well. Gradually add the flour to the butter mixture and combine. Beat egg whites til frothy. Roll dough into small balls (mine were a bit under an inch), roll in egg whites, then roll in coconut. Place on cookie sheet lined with parchment paper and use your thumb to make an indentation in each ccookie. Bake at 350 degrees for 15 minutes. When cookies are cool, add small amount of jam. Are you drinking tea on Jan. 20? If I had this, I would be happy to have my tea in it next Tuesday! My mom, aunt and I were out shopping over the weekend and didn't find a thing we liked. When the three of us can hit a T.J. Maxx and More and Marshall's and leave empty handed during clearance season, you know something is wrong. 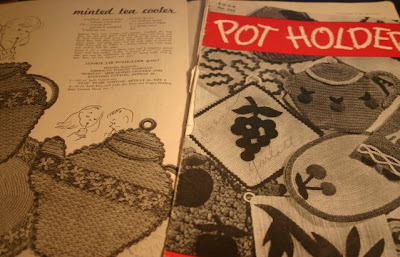 Fortunately, one of our favorite antique malls, The Classy Flea in Marietta, turned up several great and thrifty finds, including these vintage pattern booklets (just $1 apiece), each of which has a pattern for a great teapot potholder. And here's a question for you: I want to make one of these potholders for a giveaway, and this is your chance to influence its design. Which of these two patterns do you like best, and what color scheme would you prefer it to be if you won? (That is, beige w/red accents, lime green w/ pink accents, baby blue w/ yellow accents, etc. I have most colors of thread awaiting.) Thanks for helping me out here! Celebrity designers we all love! I (heart) flowers & tea too!